An unaltered photocopy of your DD-214, WD AGO, NAVPERS, NG or other military issued document clearly displaying your Certificate of Merit authorization. In Recognition of Conspicuously Meritorious and Outstanding Performance of Military Duty Against The Enemy in (Country). This honorable award, subsquently replaced by the Distinguished Service Medal and Distinguished Service Cross, and colors installed in the Silver Star Medal, served upon with praise is presented with appreciation. The Certificate of Merit was established Congress 3 March 1847; and authorized by War Department General Orders Number 4, 11 January 1905. 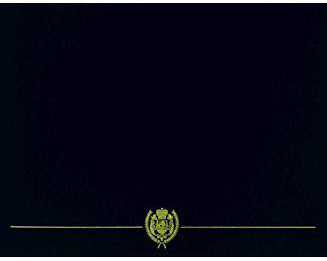 Authorized for qualifying service in the war with Mexico (May 13, 1846 to May 30, 1848). Rreinstituted effective June 22, 1874 and remained in effect until July 9, 1918 when it was disestablished by Act of Congress. Awarded For Gallantry in Action During the Mexican War: From May 13, 1846 through May 30, 1848. Awarded "to any private soldier who has distinguished himself by gallantry performed in the presence of the enemy." During this period 539 Certificates of Merit were approved. For Gallantry in Action (Post-Civil War): From June 22, 1874 through February 10, 1892 awarded for extraordinary gallantry by private soldiers in the presence of the enemy. A total of 462 Certificates of Merit were awarded for gallantry in action between 1874 and 1918, when it was disestablished. For Distinguished Service Other Than In Action: From February 11, 1892 through July 9, 1918 awarded to enlisted members of the Army for "distinguished service whether in action or otherwise, of valuable character to the United States, as, for example, extraordinary exertion in the preservation of human life, or in the preservation of public property, or rescuing public property from destruction by fire or other-wise, or any hazardous service by which the Government is saved loss in men and material." A total of 205 Certificates of Merit were awarded under these criteria. The Certificate of Merit is obsolete, but based on the fact that it was ultimately replaced by the Distinguished Service Cross its order of precedence would be after the Medal of Honor and before all other decorations. No provisions were made for devices to be worn on the Certificate of Merit Medal. The first recipient of the Certificate of Merit medal (medal number 1) was First Lieutenant William B. Baker, December 30, 1907. His Certificate of Merit was awarded for distinguished service in action at Manila on August 13, 1898, while serving as a corporal in the Astor Battery. The last recipient of the Certificate of Merit medal (medal number 361) was George Arrington, on May 1, 1919 for gallant and meritorious conduct while serving as a Private in Company C, 24th Infantry. Arrington served with "a detachment escorting Major Joseph W. Wham, Paymaster, U.S. Army, in an encounter with a band of robbers, by whom the party was attacked between Forts Grant and Thomas, Arizona, May 11, 1889." In the center of a bronze medallion one and a quarter inches in diameter, a Roman war eagle with wings partly displayed. Its head is in profile (to the left), and the eagle is surrounded by the Latin inscription VIRTUTIS ET AUDACIAE MONUMENTUM ET PRAEMIUM. The eagle was modeled by Millet from life-sized marble antique statue then in the possession of Lord Weyms, who was well-known for his interest in British volunteers. The eagle represents the American bald eagle and military service. The inscription means "courage and virtue are their own reward and monument." In the center of a bronze medallion one and a quarter inches in diameter, the words FOR MERIT surrounded by a wreath composed of two branches of oak, the stems joined at the bottom by a conventional bow. The whole is in a circle Composed of the words, UNITED STATES ARMY in the upper half and thirteen stars in the lower half. The inscription in the center denotes the purpose of the medal while the oak wreath represents strength, courage and achievement. The thirteen stars refer to the original thirteen colonies and thereby to the United States. The ribbon colors are taken from the flag and represent the United States. The color blue is at the outer edges (the "senior" position on the ribbon) because blue is the national color. The colors were arranged in two adjacent bands of red, white and blue (separated by a white stripe) to distinguish this ribbon from all others employing some combination of red, white and blue. 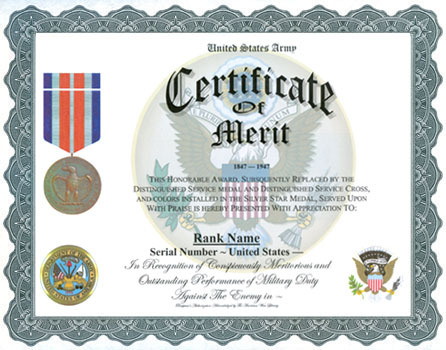 When the Certificate of Merit was disestablished by Act of Congress in 1918, the law provided that the "Distinguished Service Medal also be issued to all enlisted men of the Army to whom the certificate of merit has been granted... in lieu of such certificates of merit, and after the passage of this act the award of the certificate of merit for distinguished service shall cease...." A total of 271 recipients applied for the Distinguished Service Medal in lieu of previously awarded Certificates of Merit. By the Act of March 5, 1934, Congress provided "That the Distinguished Service Cross shall be issued to all enlisted men of the Army to whom the certificate of merit was issued" and that "those persons who have heretofore received the Distinguished Service Medal [in lieu of a Certificate of Merit] shall be issued the Distinguished Service Cross provided the Distinguished Service Medal is first surrendered to the War Department." Only 54 holders of the Certificate of Merit applied for a Distinguished Service Cross in lieu of their certificate; through July of 1941 an additional 21 received the Distinguished Service Cross in lieu of the Distinguished Service Medal which they had applied for under the provisions of the 1918 law.